Yesterday I was reflecting on how I test bows when I’m searching for new inventory and these thoughts led me to think of the VSA competition and the differences in judging between the instruments and the bows. In my opinion it is not an equal process and does disservice to both bow makers and musicians. Before I get into detail on the VSA bow judging process, let me go over my criteria for a really good bow. When my wife and I are searching for bows to purchase for resale in the shop, we split our duties. I check for technical and condition issues while she tests for usability as a musical tool. It must be stated that we emphasize function over all other considerations when looking for bows to purchase. 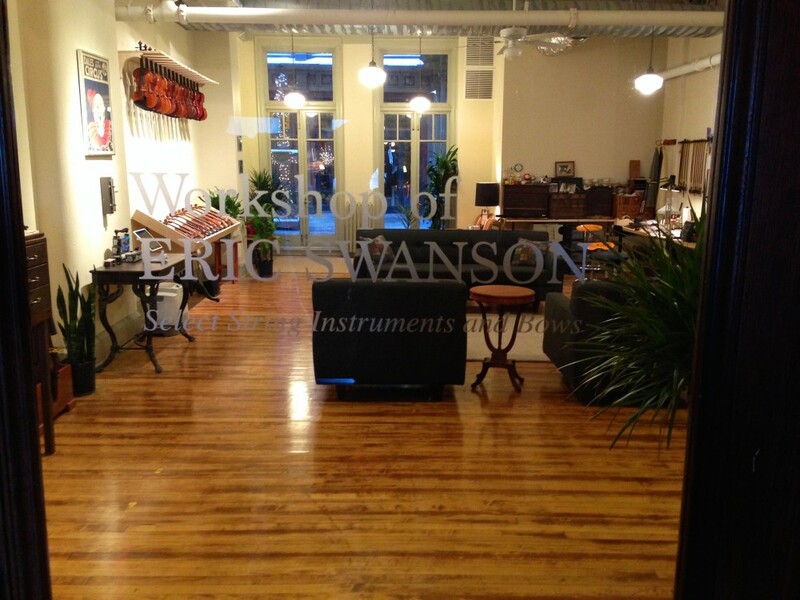 (Read a detailed essay on technical considerations for both instruments and bows on my website at: http://swansonbows.com/essays.html#technical.). The first thing I look at is the weight and balance of the bow, with an emphasis on the balance point. If a bow is slightly light or heavy, but balanced well, it may still play wonderfully. Many, many bows are out of sync in this regard. Secondly I take a close look at condition issues like straightness, twist, camber, repairs and hidden cracks. Thirdly I consider whether the frog and button are original to the stick and look at the overall craftsmanship of the bow. Fourth, I determine whether certain aspects of the bow can be improved by repair or adjustment. Lastly, I consider attribution and price point, because bows are mainly valued by who made the bow, rather than function. Sometimes I find great bows that are fairly priced, but the most common situation is to find functionally horrible bows that are vastly overvalued because of attribution. My wife tests for playability. In the past we both would independently check each and every bow in a collection and later compare notes, but she has honed her bow testing skills to such a degree that I now mainly examine the bows she chooses. Some of these bows are eliminated by me for repair and condition issues, but many are marked for purchase. What does she look for and how does she test? I’ve been trying to get her to put her technique into writing, but it hasn’t happened yet. However, If you look at our website’s home page (http://swansonbows.com/home.html) you can read a bit about her bow testing routine. She tests for delicate and difficult spiccato passages which she refers to as “orchestral spiccato”, as well as the louder more soloistic spiccato which is a little more off the string. Next she considers the bow’s strength performance in more powerful, louder passages – does the bow collapse or give out for example. Finally she considers the bow’s performance in delicate, lyrical pieces that are played slowly and where the flow of passages must connect to one another seamlessly. Here the steady draw of the bow from tip to frog and back again must be smooth and stable – the bow must sit in the string and hold steady without wobble or major control issues. This is just a glimpse into the testing she puts the sticks though – her full process is much more involved and includes certain pieces and passages as well as a number of other technical variations. Here it should be pointed out that there is no such thing as the perfect bow for all styles of musicians – we consider a wide range of bows when testing. Some bows are stronger and more tip heavy, with plenty of camber right behind the head, which suit younger players who are still working on mastering technique and want a more hard-driving type stick. Other bows are lighter, more flexible, and have a less aggressive camber. These may suited for more mature players with masterful technique, who can pull a wide rage of colors from their instruments with such sticks. Believe me when I say this process of selection isn’t simply hyperbole. I have seen the looks in the eyes of my wife’s colleagues when they pick up and test a bow we have selected using this process. Make no mistake, we are out to purchase bows in order to sell them and make a profit and therefore a living – it’s just that we choose to sell bows based on playability first and foremost, with condition, attribution, and price point as important considerations, of course. It is my experience that many musicians, especially students, who are searching for bows haven’t fully considered their criteria for testing, leading to mistakes in bow selection. It also seems that string musicians spend so much time concentrating on their left hand that the role of bow is undervalued. The right hand and bow is just as important as the instrument and the left hand. What then should one look for when searching for a bow? Once again I say function, function, function. Price point and attribution are certainly important, but I believe there are great and terrible bows in every price range. This brings me to the VSA and how the bows are judged. Every competition year, successful luthiers, bow-makers and world-renowned experts are recruited to judge bows and instruments. They take a look at the technical execution and overall stylistic impression. Competitors are held to a very high standard of construction and craftsmanship. The judges work very hard to do the best job they can, working independently and as a group to fairly judge the construction, varnish, set-up, modeling and a host of other issues. The string instruments are also tested by musicians for playability and tone. There are hundreds of violins, violas, cellos and basses to test and these musicians go through each instrument – an incredible task. In order to win a medal, instruments must get the approval of both craftsmen and musicians. Some instruments get what’s called a “tone award” because while they may not have been constructed to the high standards required by the technical judges, they may play fantastically. Let’s face it, many of the classical makers from the past, whose instruments are extraordinarily expensive and highly prized by professionals everywhere, would never win gold medals at the VSA. This is why some makers prize the tone award over gold medals. The bows are not played or judged by musicians. They are judged solely by experts and bow makers. In the past, when I inquired as to why this is, I was told by a former judge that he and his fellow experts could tell whether the bow would play well solely by examining it. As a shop owner and bow maker who buys bows and makes them as well, I can tell you there is a lot of truth to that statement, but I can also tell you that I am a lousy violinist and that the demands made on bows by highly trained classical musicians are far more nuanced and complex for even our best experts to predict by technical examination alone. The best we can do is have a hunch or an educated guess. There is no way around this truth. The fact that musicians don’t judge the bows has other consequences as well. When the winners are announced, it is traditional to have the musician judges sit on a stage and play the winning instruments, commenting on their choice and answering questions from the audience. This is a wonderful advertisement for the maker, a potential learning opportunity for audience members and a way for craftsmen to connect with players. The winning bows are on hand, but are usually not commented on – how can they be, when the musician-judge has never seen nor played them? This relegates bows and bow-makers to a kind of second-class citizenship, where winning craftsmen miss out on having musicians play their bows and comment publicly on their attributes. Bow makers also never win the equivalent of a Tone Award. Is there not merit to a bow that may be technically or artistically lacking, but plays amazingly well? I have many years of experience with bows and the violin business. It is a business where the foremost experts are considered to be those who focus on attribution and who often write certificates. Those who are experts in playability and function are fewer and harder to find. Beauty of line and artistic composition are certainly major considerations when looking at bows, but what does any of that matter if it doesn’t function as a musical tool with which one may ply their trade? There is certainly artistic and historical merit to the classic French bows made primarily in the 19th and early 20th centuries, but not every expensive, beautiful French bow functions well and most of these sticks would never win awards at the VSA for perfection of construction. By the same token, not every perfectly executed, gold-medal-winning bow is a playable, functional bow. Are modern bow makers to be winners of what is essentially a beauty pageant when competing at the VSA? Are bows simply expensive, pretty accessories or are they, as any professional musician knows, essential tools for music making? The classic French makers whom we all admire generally made bows in an extraordinary short time compared to modern makers. These historical craftsman had to make a living and therefore worked in such a manner that allowed them to try and create functional, beautiful bows in a timely manner. While the necessary rush of commerce, where time equaled money, prevented some French bows from being as technically perfect as they could have been, the modern emphasis on cleanliness of craftsmanship and perfect fitting of parts ensures that there is a commensurate lack of consideration of playability. The market and culture has changed to a large extent and it is my belief that we are in a period of Renaissance in bow making – bows are being made to a higher standard than ever and makers are commanding higher prices. It would be a shame to see a lack of discussion of functionality in our competitions and workshops prevent modern makers from eventually taking their places alongside the historic makers of the past. Let musicians judge the bows at the VSA competitions and bring bows and bow-makers out of the closet and onto the stage where they belong. Let’s judge bows not only on the cleanliness of construction, but on their usefulness to musicians as well. Older bows are rapidly rising in price and it is time that modern bows be appreciated by musicians everywhere for their value, function and beauty. NOTE: Please realize that I respect the VSA and all the hard work that goes into putting together the conferences and competitions. I have attended many of these events and have benefitted greatly. I also realize that designing a judging system from both a logistical and conceptual perspective must be enormously difficult. My wife and I freely volunteer our assistance should any official from the VSA wish to work on the creation of judging guidelines for musicians when considering bows. I’ve been thinking recently that the people who would most likely be opposed to the idea of bows at VSA competitions being judged by musicians are the bow-makers themselves! Recent discussions on maestronet show how dedicated certain gate keepers are to preventing bows from being tested by musicians at VSA Competitions. The concept that the bows are “tested for playability, just not played” smacks of Orwellian doublespeak. The idea that bow makers just know what a great bow is by examining it, while violin making judges, and makers, by logical extension, require the assistance of musicians in order to determine whether their instruments are good or not is definitely strange. The point that the testing of bows by musicians has been tried and failed in the distant past doesn’t mean it is a bad idea, just that it may have been executed poorly. The VSA Competition may be considered by many to be the most “prestigious” in the world, but that certainly doesn’t mean it can’t evolve. My wife and I attended the latest VSA competition in Cleveland. One of the main reasons we went was to look at and play the competition bows, especially the medal winners. At the end of the week, the medals are announced at a banquet and the competion room, which was closed all week for judging, is opened to paying attendees. It must be noted that there are no allowances made for members of the local musician community to enter the completion room to try instruments unless they have paid for a $90+ day pass, although I have been told a single low entrance fee for players is being considered. Once again the VSA makes it difficult for working musicians or students to try the new instruments at the center of the conference and in doing so they certainly aren’t helping the competing makers. It’s interesting. 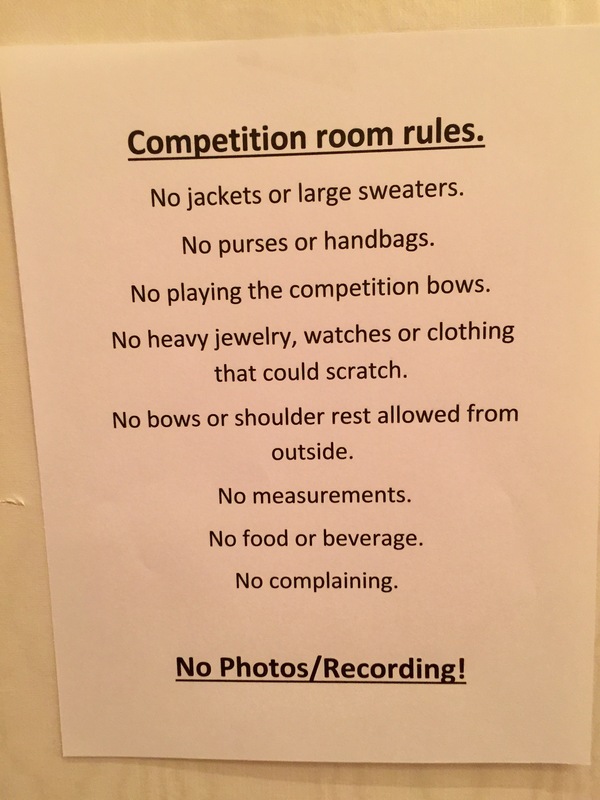 I have been attending these events off and on for over fifteen years and I know that the bows are not played by musicians in judging, but somehow it completely escaped my notice that no one is allowed to actually play the bows once the competition is over. Why is this the case? Are the bows somehow inherently more fragile than the violins, violas and cellos? Is this an effort to eliminate potential criticism of the bow judging process? Who knows at this point. Needless to say we were disappointed. We were curious in an academic sense how the winning bows would stand up to our function testing system AND we were hoping to perhaps buy some bows to sell in our shop in downtown Chicago. Unfortunately for the competing bow makers, we didn’t even bother to look at their work after all. We don’t buy bows we can’t play. Way to go VSA – brilliant.